- Pyramus was the man in the mythical story Pyramus and Thisbe that decided to run away with Thisbe. - They chose to meet at a specified meeting place. - A lioness came by Thisbe and stepped on the cloak, which made it look bloody. Pyramus was devastated at the thought of his Thisbe being dead and killed himself as well. 1. Hondius(artist last name), Abraham(artist first name). "Pyramus." Greek Mythology Link. 26 May 2008 <"The Royal House of Athens." 26 May 2008 .>. 2. "Pyramus and Thisbe." Encyclopedia Mythica. 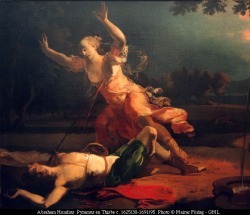 26 May 2008 <http://www.pantheon.org/articles/p/pyramus_and_thisbe.html>.